Witches have been closely associated with Lancashire for 400 years and a stylised image of a woman with a big nose and a pointed hat riding on a broomstick is one which has become associated with the county, especially the Pendle Hill area. On Halloween crowds of people climb Pendle Hill after dark, with candles or torches, to look for witches. This follows an old tradition of Lating (lighting) the Witches, when people would climb the hill carrying lighted candles from eleven until midnight on the eve of All Hallows. Popular belief was that whilst the candle burned you were safe, but if it was blown out by the witches it was a bad omen and disasters would follow. Those who climb the hill today may not realise that the traditions they are following date back hundreds of years and have their roots in beliefs and customs that predate the Lancashire witch trials of 1612. Halloween marks the pagan feast of Samhain when the harvest is gathered in and the darker half of the year begins. As darkness fell on the 31st October pagans celebrated the eve of the Feast of the Dead. This was a time when the veils between this world and the Otherworld were believed to be at their thinnest. As Christianity took hold, the feast day on the 1st November was changed to that of All Saints, or All Hallows, which commemorates the souls of the dead and so the previous evening became known as Halloween. Fire, to ward off evil spirits, was an important part of the Samhain celebration and early Christian rituals were heavily influenced by the old pagan ones. Even after the Reformation, when old Catholic rites were outlawed, people continued to hold vigils for the dead under cover of darkness. Until the early 19th century, in the parish of Whalley, families would gather at midnight on All Hallows Eve and one person would hold a large bunch of burning straw on a pitchfork whilst the others knelt in a circle and prayed for their dead until the flames burned out. Carving turnips and more recently pumpkins with faces and setting a candle inside them is also connected with this night and may have been influenced by ancestor worship – the earliest candles possibly being placed inside the skulls of the dead. The 2nd November is All Souls Day. On this day special prayers were said for the dead who were in purgatory awaiting entry into heaven. Children and the poor would go door to door to receive soul cakes and in return they would promise to say prayers for the souls of the dead to speed them into heaven. Soul cakes or mass cakes were made with oatmeal and varied from place to place. Sometimes they were flat, round cakes with the shape of the cross on them, but in Lancashire they were similar to what is now known as parkin. Many of these old traditions have now become associated with both Halloween and Bonfire Night. Other traditions associated with the Lancashire witches include the belief that there is a witch’s grave in the churchyard of Newchurch in Pendle and that the ‘eye of God’ on the tower of the church wards off evil. There is a grave located near to the south wall of the church that is engraved, not only with a skull and crossbones, but with the names of members of the Nutter family. Alice Nutter, who lived at nearby Roughlee Hall, was a gentlewoman who was hanged at Lancaster as a witch in 1612. In his book The Wonderfull Discoverie of Witches in the Countie of Lancaster Thomas Potts describes her as a rich woman who had good estate and children of good hope. She was ‘in the common opinion of the world, of good temper, free from envy or malice.’ But this is not her grave. Those accused of witchcraft were not given a Christian burial but their bodies were burned to destroy the evil of their souls. You will see witches at Newchurch though. There are three who sit outside the small shop named Witches Galore. 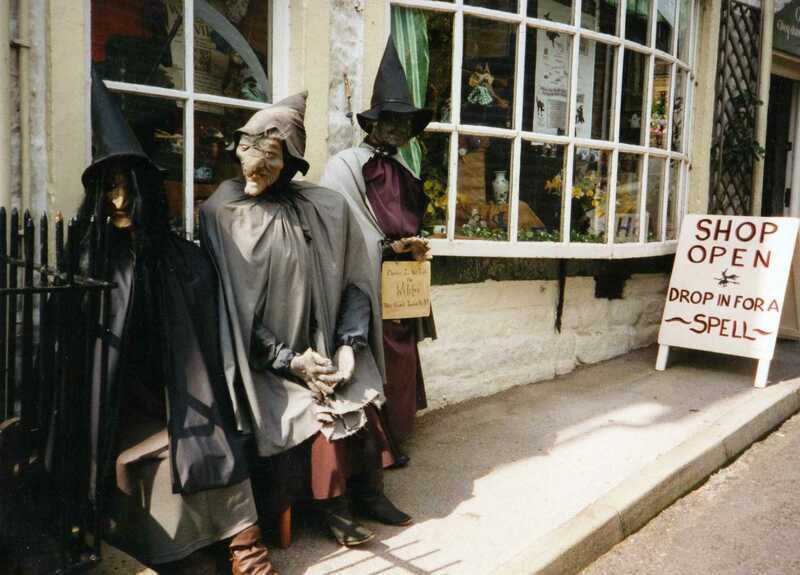 They have become quite a tourist attraction with their pointed hats and ugly faces leering at passers-by and inside the shop you can buy all manner of witchy memorabilia. You will also see the witch on a broomstick logo on the buses called the Witch Way that run between Pennine Lancashire and Manchester. Each bus is named after one of the Lancashire witches. All Hallows simply means All Saints and the church is dedicated to all the saints rather than one specific saint. It isn’t an unusual name for a church. the church got its name? Fascinating information! I love ‘Mist Over Pendle’ – and the shop at Newchurch too! Previous What a beautiful cover!